A gnome which was stolen from a garden in Gloucester by a student who took him on a world tour is to become the star in a new children's book series. 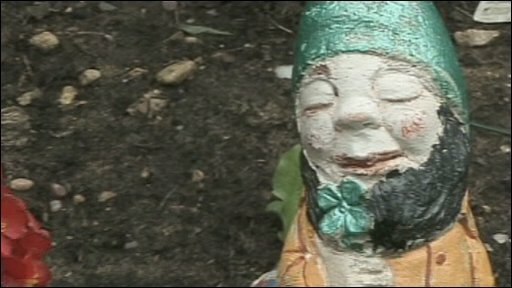 Murphy the gnome was taken from Eve Stuart-Kelso's home in February 2008 and returned seven months later with photos showing him in 12 countries. The story made the international headlines and his owner registered the gnome as a trademark. Simon Randles, from Reading, was later revealed to be the kidnapper. Mrs Stuart-Kelso, a grandmother of three, has since become friends with Mr Randles, the law graduate who took Murphy on his global tour. The gnome visited South Africa, Swaziland, Mozambique, New Zealand, Australia, Singapore, Thailand, Cambodia, Vietnam, China, Hong Kong and Laos. He was even pictured abseiling down a mountain, standing in a shark's mouth and riding a motorbike. The books have been written by children's author Gordon Volke and the first one in the series is called "Murphy and the Magic Passport". It is hoped that the books will educate young children about different countries in the world.